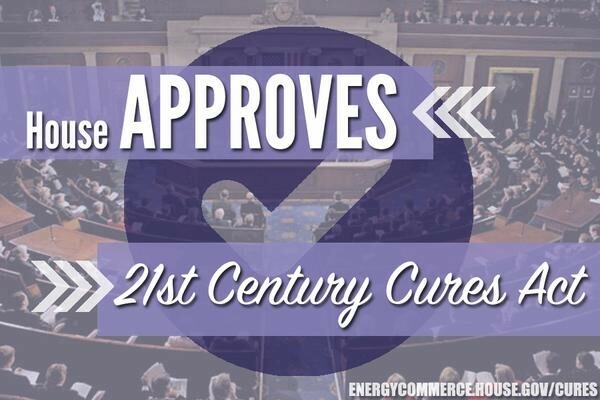 WASHINGTON, July 10, 2015 /PRNewswire-USNewswire/ -- The National MS Society applauds the passage of the 21st Century Cures Act (H.R. 6) by the U.S. House of Representatives. Focused on getting treatments to patients more quickly by modernizing the medical innovation ecosystem, this legislation would help move us closer to a world free of MS.
Establishing a data collection system to identify risk factors for MS: H.R. 6 creates the National Neurological Diseases Surveillance System, which will collect data about people living with neurological conditions in an effort to better understand prevalence, incidence and environmental factors related to neurological diseases so that researchers have more comprehensive data to use when investigating new treatments for those diseases. This surveillance system is especially important to people living with multiple sclerosis (MS) because the last national study gathering such data was in 1975. Increasing resources for the National Institutes of Health and U.S. Food and Drug Administration: H.R. 6 calls for increased discretionary funding for the NIH and establishes the NIH Innovation Fund, which will increase NIH funding by $8.75 billion total from 2016 to 2020. The NIH Innovation Fund will be used to support biomedical research through basic, translational, and clinical research. The bill also provides $550 million for the FDA to implement many of the proposed changes in the bill. Incorporating patients perspectives into drug development and review: H.R. 6 strengthens the FDA's ability to take the direct experiences of patients with particular diseases and conditions then use that data to modify and improve potential treatments. "The passage of the 21st Century Cures Act would bring us one step closer to resolving the mystery of MS," said Cyndi Zagieboylo, President and CEO of the National MS Society. "By dedicating additional resources and creating new systems, the medical community will be better poised to make new discoveries to help people with MS live their best lives." National MS Society Advocacy To move this bill forward, MS activists sent over 8,000 messages to their Representatives, made hundreds of in-person visits and placed multiple Op-Eds in local news sources. The result was overwhelming bi-partisan support for the bill with 230 Representatives—over half of the House—cosponsoring the bill. The National MS Society will continue to fervently advocate for the Senate to include our priority issues in the Senate bill on medical innovation. Multiple sclerosis, an unpredictable, often disabling disease of the central nervous system, interrupts the flow of information within the brain, and between the brain and body. Symptoms range from numbness and tingling to blindness and paralysis. The progress, severity and specific symptoms of MS in any one person cannot yet be predicted, but advances in research and treatment are moving us closer to a world free of MS. Most people with MS are diagnosed between the ages of 20 and 50, with at least two to three times more women than men being diagnosed with the disease. MS affects more than 2.3 million worldwide. About the National Multiple Sclerosis Society The Society mobilizes people and resources to drive research for a cure and to address the challenges of everyone affected by MS. To fulfill this mission, the Society funds cutting-edge research, drives change through advocacy, facilitates professional education, collaborates with MS organizations around the world, and provides programs and services designed to help people with MS and their families move their lives forward. In 2014 alone, through our comprehensive nationwide network of programs and services, the Society devoted $122.2 million to assist more than one million individuals to connect to the people, information and resources they needed. To move us closer to a world free of MS, the Society also invested $50.2 million to support more than 380 new and ongoing research projects around the world. The Society is dedicated to achieving a world free of MS. Learn more at: www.nationalMSsociety.org.